The varying brightness of an exoplanet called 55 Cancri e is shown in this plot of infrared data captured by NASA's Spitzer Space Telescope. Observations from NASA's Spitzer Space Telescope have led to the first temperature map of a super-Earth planet -- a rocky planet nearly two times as big as ours. The map reveals extreme temperature swings from one side of the planet to the other, and hints that a possible reason for this is the presence of lava flows. "Our view of this planet keeps evolving," said Brice Olivier Demory of the University of Cambridge, England, lead author of a new report appearing in the March 30 issue of the journal Nature. "The latest findings tell us the planet has hot nights and significantly hotter days. This indicates the planet inefficiently transports heat around the planet. We propose this could be explained by an atmosphere that would exist only on the day side of the planet, or by lava flows at the planet surface." 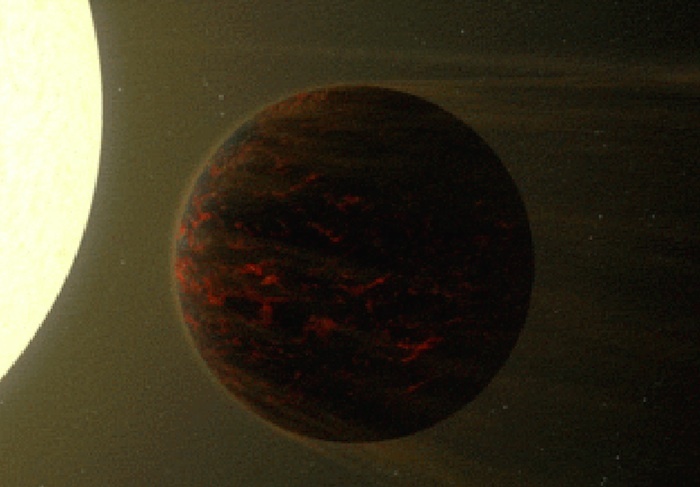 The toasty super-Earth 55 Cancri e is relatively close to Earth at 40 light-years away. It orbits very close to its star, whipping around it every 18 hours. Because of the planet's proximity to the star, it is tidally locked by gravity just as our moon is to Earth. That means one side of 55 Cancri, referred to as the day side, is always cooking under the intense heat of its star, while the night side remains in the dark and is much cooler. "Spitzer observed the phases of 55 Cancri e, similar to the phases of the moon as seen from the Earth. 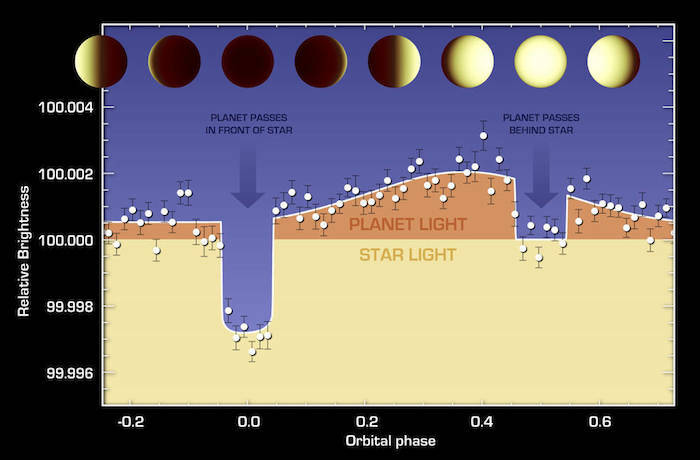 We were able to observe the first, last quarters, new and full phases of this small exoplanet," said Demory. "In return, these observations helped us build a map of the planet. This map informs us which regions are hot on the planet." Spitzer stared at the planet with its infrared vision for a total of 80 hours, watching it orbit all the way around its star multiple times. These data allowed scientists to map temperature changes across the entire planet. To their surprise, they found a dramatic temperature difference of 2,340 degrees Fahrenheit (1,300 Kelvin) from one side of the planet to the other. The hottest side is nearly 4,400 degrees Fahrenheit (2,700 Kelvin), and the coolest is 2,060 degrees Fahrenheit (1,400 Kelvin). "The day side could possibly have rivers of lava and big pools of extremely hot magma, but we think the night side would have solidified lava flows like those found in Hawaii," said Michael Gillon, University of Liège, Belgium. Additional observations, including from NASA's upcoming James Webb Space Telescope, will help to confirm the true nature of 55 Cancri e.
The new Spitzer observations of 55 Cancri are more detailed thanks to the telescope’s increased sensitivity to exoplanets. Over the past several years, scientists and engineers have figured out new ways to enhance Spitzer’s ability to measure changes in the brightness of exoplanet systems. One method involves precisely characterizing Spitzer’s detectors, specifically measuring “the sweet spot” -- a single pixel on the detector -- which was determined to be optimal for exoplanet studies. “By understanding the characteristics of the instrument -- and using novel calibration techniques of a small region of a single pixel -- we are attempting to eke out every bit of science possible from a detector that was not designed for this type of high-precision observation,” said Jessica Krick of NASA’s Spitzer Space Science Center, at the California Institute of Technology in Pasadena. NASA's Jet Propulsion Laboratory (JPL) in Pasadena, California, manages the Spitzer Space Telescope mission for NASA's Science Mission Directorate, Washington. Science operations are conducted at the Spitzer Science Center. Spacecraft operations are based at Lockheed Martin Space Systems Company, Littleton, Colorado. Data are archived at the Infrared Science Archive housed at the Infrared Processing and Analysis Center at Caltech. Caltech manages JPL for NASA.